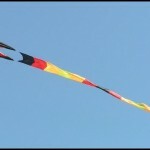 No one is really sure exactly how many times the Cleveland kite festival has taken place. This kite fly is held at Edgewater Park in downtown Cleveland, Ohio on the shore of Lake Erie began sometime in the early 1980’s in combination with a local charity. 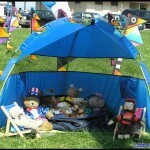 The event was initially a success and the charity moved more and more of their activities away from kite flying. 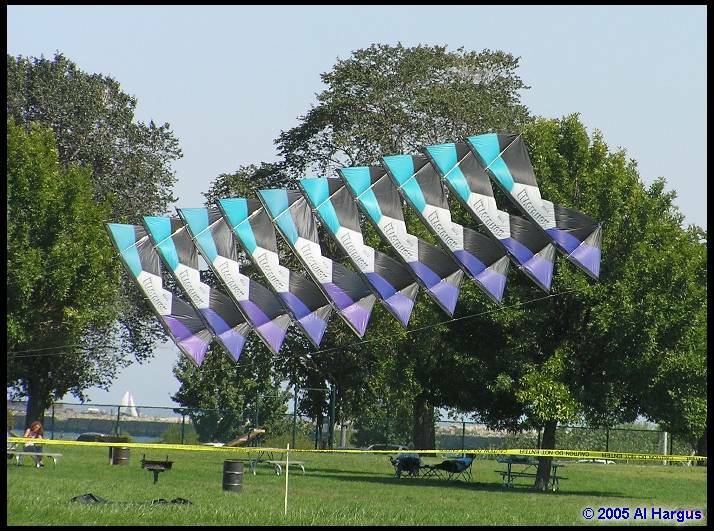 The Ohio Society for the Elevation of Kites finally decided that they would host their own festival without the interference of non-kite fliers So the 2005 edition of the Cleveland Kite Festival is more then Twenty-something years old. 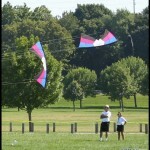 This years event hosted around 100 local kite fliers. 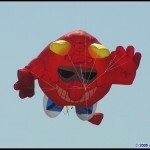 Many of the flying activities center around the kite fliers themselves. (a left over of the problems associated with a non-kite flier charity event) With kite games, mass ascensions, mystery ballet contests, and team and individual Rokkaku kite battles hosted throughout the two day event. The festival is loosely based on Individual and Team days, with one day featuring Individual activities and the other featuring team events. 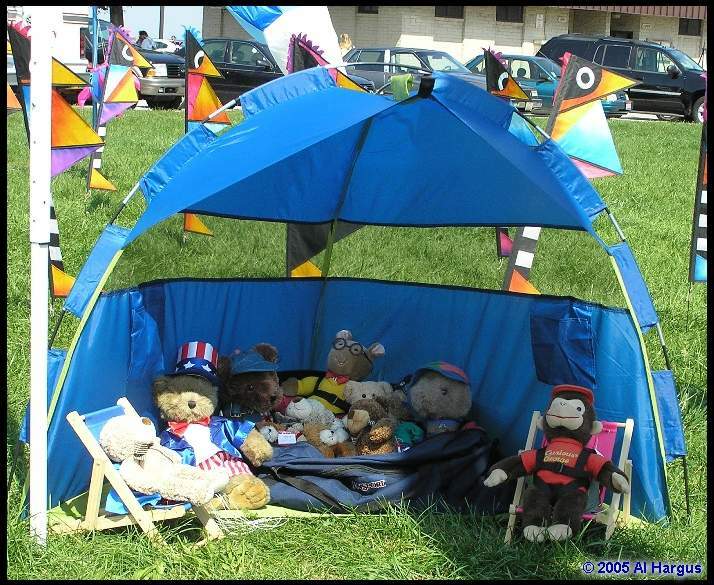 One of the concessions to Kite fliers only is the Kite-making workshop tent (manned much of the weekend by the Lockharts) which for a small fee helped the local visitors make a simple kite to fly out on the field. Only one flying field is roped off for use as a demo, games field so there was more then enough room for anyone to fly. The Cleveland Kite Fest is a pretty casual event. Although OSEK President, Harry Gregory sets up a schedule and really tries to keep things on time, winds and other natural forces always seem to let things happen at their own speed. 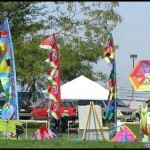 Nancy Lockwood set up a very informative Kite Display Area based on historical kites of all types. Each kite in the display has a place card to explain it’s significance in the history of kite-flying. 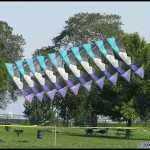 It is one of the most extensive historical outdoors kite displays in the USA. Slack line, Trick and Freestyle fliers put on a very informative and interesting display of this new area of dual line kite-flying. Lee Sedgwick came to the festival with a van load of his ‘slightly unusual’ round UFO kites, flown as single line, dual line, in trains and as quad line kites. 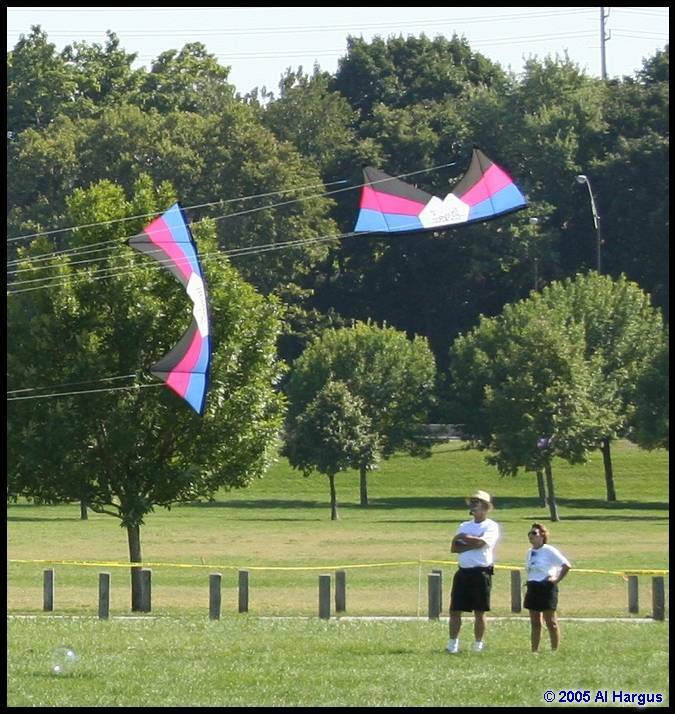 These new ‘kites’ are pretty addictive for kite fliers and Lee had plenty of spare UFO’s for everyone to experiment with. Sky Jesters, Side Show, Rob-N-Air, The Flying Turtles, and Higher Power were just a few of the pairs and teams that showed their flying expertise throughout the weekend. 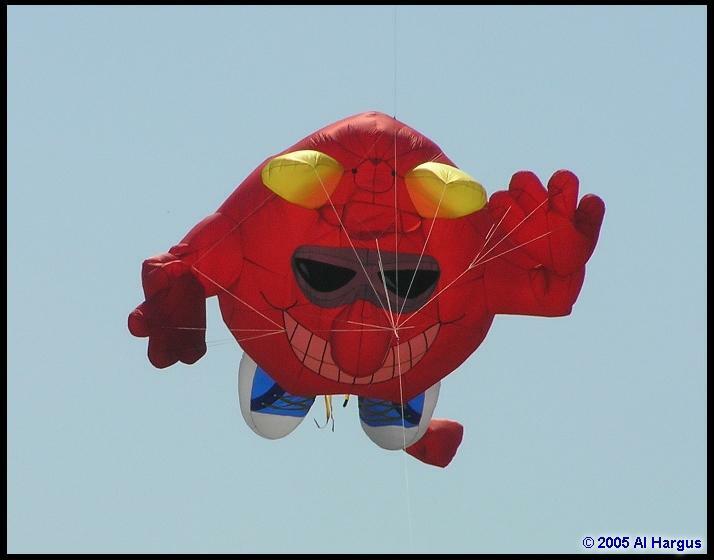 For the last several years the Festival has fallen on the September 11th weekend so Red White and Blue kites are featured. 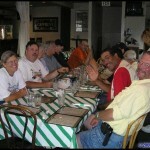 In keeping with the patriotic theme this years invited guests were the Windjammers kite Team. This year only two of the team made the trip from Detroit. Team Captain Gary Maynard stated that the rest of the team was infected with what he called ‘Out of Work Flu’ and were unable to attend. Although the some of the team regulars were not in attendance we were entertained by the Windjammers newest team member, Jason Maynard, Gary’s son filled in quite well in his first public appearance with Gary and Jason flying trains of 14 DynaKites (R,W, and B of course). 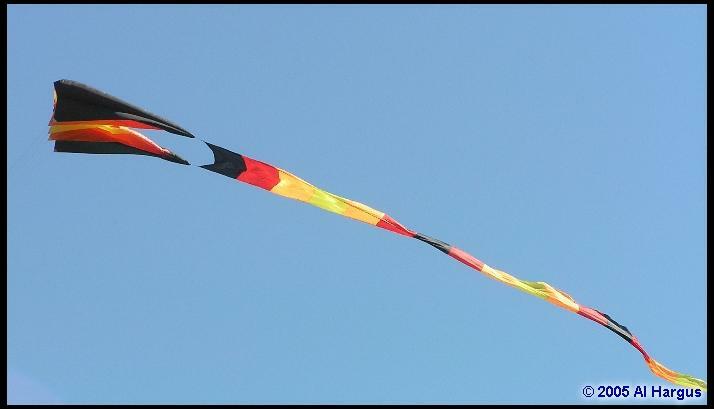 To give credit and recognition to all of the kite-fliers who made the Cleveland Kite Festival this year a success you would have to list the entire membership of the Ohio Society for the Elevation of Kites, The Black Swamp Air Force, Pigs Aloft of Cincinnati, the Columbus Kiters and many other individuals and groups. 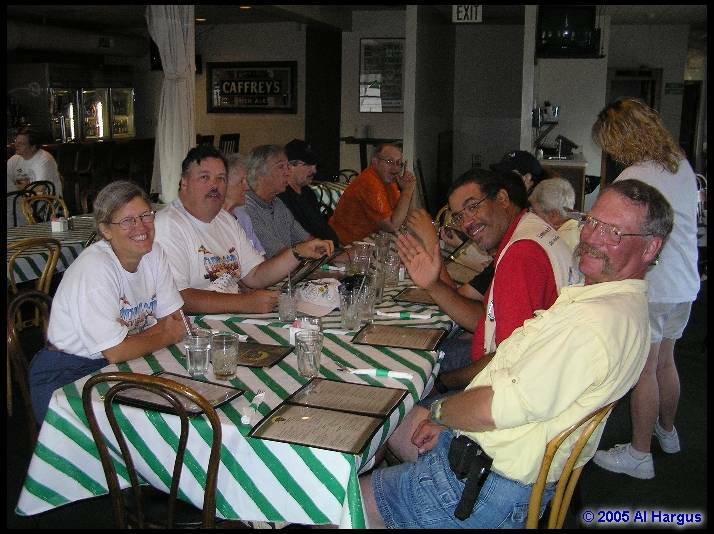 The Ohio Society for the Elevation of Kites is one of the oldest active kite clubs in the USA, formed in 1977 OSEK has over 150 members. 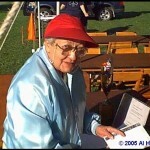 More information about OSEK and their many local events can be found at their extensive web site. 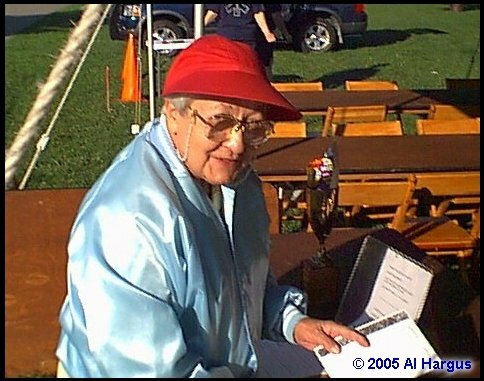 This entry was posted in 2005, Events / Festivals, Issue 44 (Sep/Oct), KL Archive, Reports and tagged art, cleveland, OSEK, sport kites.